Where do you go dear soul? Where do you go dear soul? My pictures and texts are exhibited in the rooms of the TelefonSeelsorge in the ecumenical center heaven@earth at Dödterstrasse 10 in 58095 Hagen, Germany. Art Exhibition for Art Purchase 2017 of the City of Dortmund at the Torhaus Rombergpark, Am Rombergpark 65, 44225 Dortmund, Germany. See here my picture, which was acquired among others. Free and independent artist group from Dortmund exhibits their works and works of artist friends. The art exhibition shows paintings and sculptures from 20.12.2017 to 27.01.2018. The finissage will take place on 27.01.2018 from 14:00 clock. 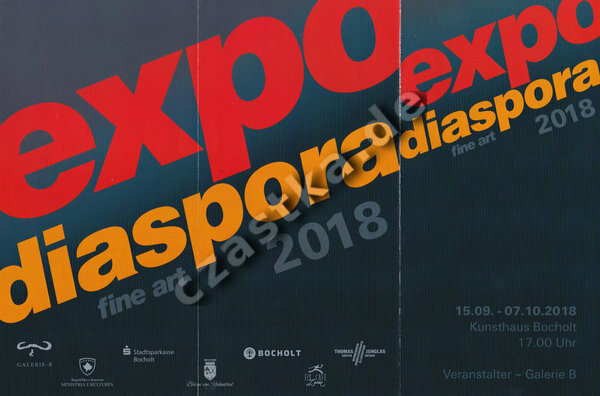 International Art Exhibition in Gallery B in Bocholt. The exhibition will take place in Gallery B at Dinxperloer Strasse 94-96, 46399 Bocholt, Germany. Until the 27th of January 2018 you can visit the exhibition. Admission is free. Here you can see my contribution to the exhibition.